For a limited time receive a 40 cm Steam Mop and a Dupray Carrying Case with your purchase of the Dupray Hill Super Inox Steam Cleaner! Retail value $263.00! The perfect steamer for commercial or high-end residential use. The Dupray Hill Super Inox Steam Cleaner combines the versatility of a compact, portable steamer with the high temperature and unmatched effectiveness of a commercial unit. This powerful Tecnovap machine is capable of cleaning and disinfecting faster than traditional methods can. The Dupray Hill Super Inox Steam Cleaner harnesses the power of steam to clean every inch of your vehicle, both inside and out and is also capable of deep cleaning nearly any area of your home. If you’ve ever used another commercial steam cleaning unit, you may have gotten the impression that these machines are beasts that are best left to professionals. Lesser consumer-grade machines take what seems like forever to heat up, use gallons upon gallons of water to run, and have only one pressure setting, making them unusable on delicate surfaces. That’s not the case with the Dupray Hill Super Inox Steam Cleaner. It heats in only 7 minutes, uses very little water, and offers fully adjustable variable pressure settings. This is especially important when working on delicate surfaces where the disinfecting power of heat is more important than the actual steam. The Hill Super Inox Steam Cleaner is ideal for many commercial and residential applications. 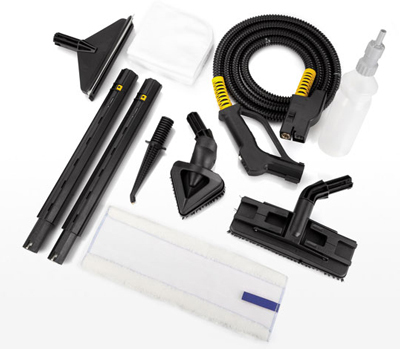 The Dupray Hill Super Inox Steam Cleaner includes a generous accessories kit for a multitude of cleaning projects. The Dupray Hill Super Inox Steam Cleaner offers a low-humidity dry steam system not usually available in an affordable commercial unit. Producing 62g per minute, the Hill Super Inox utilizes steam with a 5% humidity content and heats to a maximum temperature of 327° assuring a perfectly clean surface that will dry quickly, eliminating the risk of mold or mildew forming. The high heat disinfects—even killing bedbugs—without the use of chemicals. Since the Dupray Hill Super Inox Steam Cleaner uses little water, has a 3.2 quart water reservoir, and can be refilled while the machine is in use, you’ll be able to finish the job even faster! Each Dupray Hill Super Inox Steam Cleaner features a stainless steel body and a 2.1 quart stainless steel boiler, making for a stronger, more durable machine that is easier to clean than inferior plastic models. The TIG welded stainless steel boiler in the Hill Super Inox is designed to outperform and outlast standard aluminum or steel found in other steamers. Each machine features an electromagnetic float system within the boiler to clean scale, calcium, and mineral build up during regular operation. This float system allows the use of tap water without the fear of clogging the machine. In fact, the system only requires a quick 60 second drain and rinse after every 50 hours of operation. If you’re worried about expensive replacement parts, don’t! Unlike other systems that require the entire boiler to be replaced when the heating element goes out, the Dupray Hill Super Inox Steam Cleaner incorporates replaceable heating elements that save you time and money! 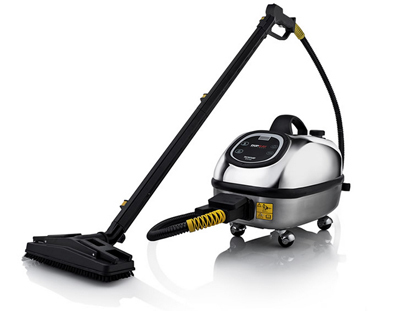 The Dupray Hill Super Inox Steam Cleaner includes 24 Tecnovap accessories designed to withstand the high temperatures that the steamer produces, while offering an option for nearly every cleaning need. With the Dupray Hill Super Inox Steam Cleaner and all of its accessories you will be able to clean your vehicle’s paint, upholstery, rims, engine bay, floor mats, carpeting and more. When you’re done detailing your vehicle, take the Dupray Hill Super Inox Steam Cleaner inside the house to clean grout, flooring, walls, upholstery, and even kill bedbugs!